Polfoto 17-05-2003 Kolbotn, Norway May 17: The Norwegian National Day King Harald and Queen Sonja meet the people on Kolbotn, East of Oslo. I&#39;d be curious to know if there any other members on this MB besides me who have been caught up in May 17 celebrations, and what their most vivid impact/memory of this event is? Grunnlovsdag means Constitution Day. On the 17th of may in 1814 Norway got it&#39;s Constitution after the dissolution of the union with Denmark for 400 years. Of course we had to wait almost 100 years more until we were completely independent (Norway went directly from a union with Denmark to a union with Sweden) but some saw the break up with Denmark as a chance to become more independent. Flag Day is an official flag-flying day, in other words, we put out our flags. Yes, I read about the blue ones too. And there are ones that are for Christians called Jesus Russ. And all of the buses. Ingrid Alexandra, Mette-Marit, Haakon and H.M. Thanks for the pictures everybody. 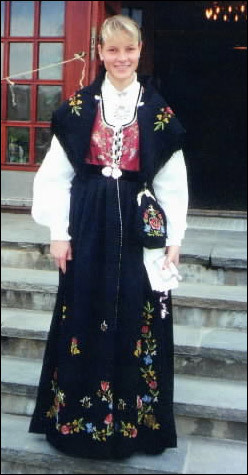 I always like to see Mette-Marit in Norway&#39;s national costume/outift. It really is quite beautiful and makes me a bit sad that I am not Nordic to have one either. It&#39;s a shame that Martha Louise no longer makes these balcony appearances as well. She always has such lovely outfits for these occasions, too. Did Martha Louise, Ari and Maud Angelica perhaps participate in National Day events elsewhere in Norway? Märtha Louise, Ari Behn and Maud Angelica were not celebrating in public. They celebrated somewhere unknown in private. Thanks for the info norwegianne. 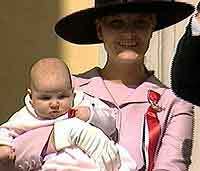 From the pictures Lena posted, there was a close up of the skirt on Mette-Marit&#39;s bunad that was quite lovely. Beautiful detailing on it, yet simple at the same time. Yep, at least in my district (which happens to be the same as Mette-Marit in this case). Though I don&#39;t know how many boys/men who know about it... at least until after the change is a fact. There are also headdresses, blouses, etc... that signify single/married in other districts. May 17. 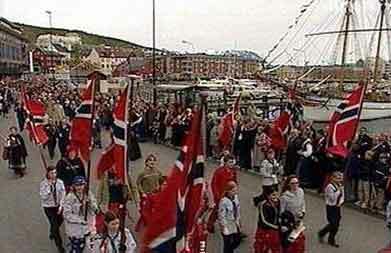 Norway's National Day. The day Norwegians celebrate the signing of the Constitution at Eidsvoll in 1814. The Norwegian Royals have a heavy programme on the day. The Crown Prince and Crown Princess greet the Children's Parade in Asker at Skaugum in the mornings, before driving into Oslo to greet the parade from the Palace balcony with the King and Queen. Unfortunately, King Harald's presence at the balcony this year is still being debated: Will he be well enough to be there? The palace will let us know soon, according to VG. Ingrid Alexandra made her first appearance on the balcony last year. Will she repeat it this year as well? Crown Princess Mette-Marit was supposed to fly to Stockholm to hold a speech with Crown Princess Victoria of Sweden, but because of the pregnancy, her trip has been cancelled. We Norwegians really know how to celebrate May 17. Syttende Mai. It will be my first ever not in Norway, and I'm planning to keep plenty busy with the celebrations in Copenhagen, from 08.00 in the morning, to about 03.30 the next morning. What can I say? We really go all out when we celebrate. 08.10	TRH The Crown Prince Regent and the Crown Princess receive the Children's Parade in Asker, Skaugum. 10.30	HRH The Crown Prince Regent, HM the Queen and HRH the Crown Princess receive the Children's parade in Oslo, Palace Balcony.